Dr. Hardy received his medical degree in 2005 from Mercer University School of Medicine. While there, he was active in numerous medical student organizations and research endeavors. He completed his internship and residency at the Mercer University Internal Medicine program at the Medical Center of Central Georgia where he served as Chief Resident. He was twice the recipient of the Most Outstanding Internal Medicine Resident award in 2007 and 2008. Dr. Hardy earned his undergraduate degree in Occupational therapy from the Medical College of Georgia in 1995. He was in the rehabilitation field in Memphis and Savannah until 2001. Dr. Hardy is a member of the Medical Association of Georgia and the Bibb County Medical Society. He is former Chief of Medicine at the Coliseum Medical Center and has been actively involved in the Coliseum Peer Review Committee. He currently serves on the Hypertension Advisory Committee for the Georgia Physicians for Accountable Care. 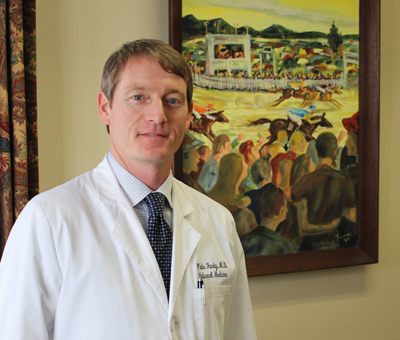 Prior to joining Internal Medicine Associates in 2013, Dr. Hardy was in private practice here in Macon. He enjoys traveling, outdoor activities, and spending time with his wife, Elizabeth, and their two children.